Please send me more information on Nautilus Live-Aboard Diving! 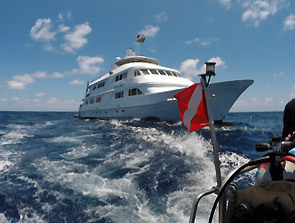 Nautilus offers a world-class live-aboard scuba diving experience with comfort and safety in mind. The company offers two state-of-the-art vessels: The Explorer and Belle Amie. Both boats featured high tech equipment, inviting staterooms, gourmet cuisine and friendly crews. Boasting cruises to some of the best diving spots in Baja Sur, the professional team of Nautilus will ensure an spectacular diving experience. Whether you choose to visit the majestic manta rays of Socorro Island (“the Galapagos Islands of Mexico”) or the magnificent sharks of Guadalupe Island, you will enjoy an unforgettable adventure at sea. Included: Diving, aluminum 80 tanks, weight belts. Use of sea kayaks (except Guadalupe great white shark cage diving trips). Marine ID presentations, zodiac kayaking instruction (except white shark trips). In-water divemastering and dive guiding with local experts. Daily room service and nightly turndown.Towels, bathrobe. Meals, snacks, non-alcoholic beverages including sodas. Not Included: We offer a selection of wines, imported and domestic beers, single malt scotches and a variety of spirits. Nitrox, argon, gas mixes. Rebreather support including zorb and specialized tank rentals. (Limited supply on a first come first serve basis). 100 cu. ft. steel tanks (16 lbs more negative than an aluminum 80). Gift shop purchases. Crew gratuities.